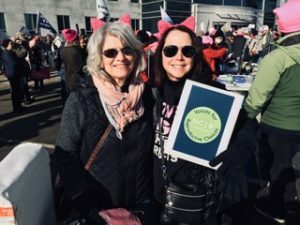 January has been a busy month for the NCJW Southern Maine Section. January 18th rang in our first inaugural Supper Club for Mothers with Young Children hosted by section member Alex Higgins. Fifteen engaged and enthusiastic women gathered for a delicious potluck spread followed by an informal presentation by Amy Bouchard, a registered dietitian and child nutrition expert. Bouchard lead the group through an insightful presentation focused on “Five Steps to Raising Healthy and Joyful Children.” Attendees then shared personal stories of wins and losses in their own households centered around food choices and strong-willed children 😉 It was an inspirational evening of camaraderie and learning for all who attended. On Saturday, January 20th State Policy Chair Patty Weber led members as they marched alongside tho usands of women to commemorate the 2017 Women’s March protesting President Trump’s inauguration. The deluge of revelations about powerful men abusing women, leading to the #MeToo moment, has pushed activists to demand deeper social and political change. Progressive women are eager to build on the movement and translate their enthusiasm into electoral victories in this year’s midterm elections. Thanks to those that turned out from NCJW and showed up in Augusta to support others and continue to fight for Reproductive rights! Let’s keep the momentum going. “We got this”!